Ondine proudly announces the world première recording of a work by Paul Hindemith, scheduled for release in spring 2009. The Klaviermusik mit Orchester op. 29 for piano left hand and orchestra, which Hindemith wrote in 1923 for Paul Wittgenstein, was only discovered in 2002 and had an acclaimed 2004 world première in Berlin with Leon Fleisher as soloist. Fleisher will also perform on April 27th during a concert by the Curtis Symphony Orchestra and Christoph Eschenbach at Philadelphia’s Verizon Hall, where the piece will be recorded together with Dvorák’s Symphony No. 9 (“From the New World”). The Curtis Institute of Music in Philadelphia and Ondine will collaborate in the production and distribution of the recording: Curtis will record, edit, and produce, while Ondine will manufacture and distribute the final product to an international market. Executive producer of the recording will be Kevin Kleinmann, formerly vice president of PolyGram/Universal Classics. The Curtis Symphony Orchestra, called "an orchestra that any city would be lucky to have as its professional ensemble" (The Philadelphia Inquirer), was last featured on a commercial recording in 1995, when EMI Classics released a disc of works by Vaughan Williams conducted by André Previn. 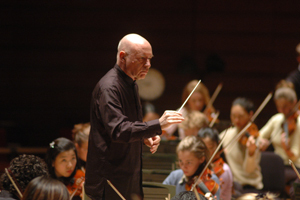 The orchestra performs a three-concert season in Philadelphia's Verizon Hall at the Kimmel Center for the Performing Arts, as well as programs elsewhere in the region and occasionally at Carnegie Hall. Recent visiting conductors include Charles Dutoit, Alan Gilbert, Simon Rattle, Michael Tilson Thomas, and Miguel Harth-Bedoya. This real-world training has enabled Curtis alumni to assume prominent positions in major orchestras across the United States, Canada, and abroad. Seventeen percent of the principal chairs in America's top twenty-five orchestras are held by Curtis-trained musicians. The Curtis Institute of Music trains exceptionally gifted young musicians for careers as performing artists on the highest professional level. One of the world's leading music schools, Curtis provides full-tuition scholarships to all of its 162 students, ensuring that admissions are based solely on artistic promise. A Curtis education is uniquely tailored to the individual student, with personalized attention from a celebrated faculty and unusually frequent performance opportunities. This distinctive "learn by doing" approach to musical training has produced an impressive number of notable artists, from such legends as Leonard Bernstein and Samuel Barber to current stars Juan Diego Flórez, Alan Gilbert, Hilary Hahn, Jennifer Higdon, and Lang Lang. For further information about the Curtis Institute of Music, visit its official website.